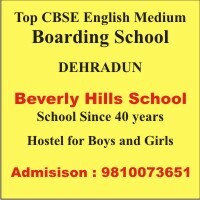 DAV Centenary Public School, Haldwani is an English Medium, co-educational school with classes from Nursery to Class XII. It has the distinction of being the first DAV institution of Kumaun established on 14th April 1987 during the Centenary Celebration of DAV Movement. The School initially started in rented premises with a modest enrolment of 200 students. We shifted to our new campus in 1996. Situated at a distance of 3.5 Kilometers from the main town on the Lamachaur Road, the school complex has a large multistorey building with all the facilities of well equipped science and computer laboratories, library, multipurpose hall, activity room, and spacious classrooms. There has been continuous efforts to refresh the content as well as methodology of teaching � learning process through workshops, seminars, and in-service training. We have been successful to a great extent in bringing out a fusion of Indian cultural values and modern scientific knowledge on one hand and spiritual growth on the other hand. In a short period the school has achieved considerable progress in almost all the facets of school life; academic, social, cultural, extra curriculum and spiritual development of the students and other members of the school community.